Make your Road Glide stand out with this awesome precut, easy-to-install graphic kit! 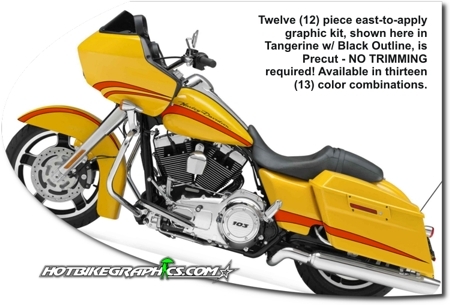 This nine (9) piece graphic kit is uniquely designed to fit Harley-Davidson's '98-'13 Road Glide. Available in one of thirteen (13) color combinations, kit is digitally printed with our DuraCOLOR graphic technology and manufactured with premium automotive grade vinyl film materials. As a further step, graphic is covered with a 2.5 mil clear laminate which provides protection from miles of abuse. Includes easy-to-follow general online installation instructions and care guide.